The East Zone Vice Chancellors’ Meet organized by the Association of Indian Universities (AIU) was held on the 19th-20th of January 2017 at Kaziranga University, Jorhat. 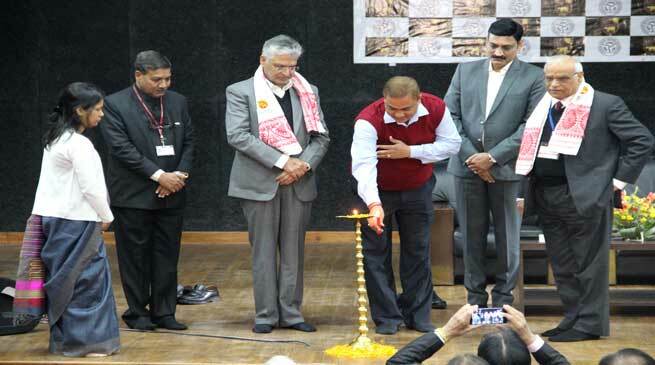 This meet was attended by 21 Vice Chancellors of the many reputed universities in the East Zone, which includes the North-Eastern states, West Bengal, Uttar Pradesh, Jharkhand to name a few. Presided over by the President of the AIU, Prof. D.S Chauhan, and the General Secretary Prof. Furqan Qamar, the objective of the meet was to look into ways to strengthen and improve the quality of higher education in the region, subsequently leading to increased employability and opportunities. Based on the overall theme of ‘Enhancing Employability of Products of Higher Education in the Eastern Region’, the meet saw many fruitful deliberations over a short span of time. With a membership of 650 Indian universities, and 11 universities from other countries, the Association of Indian Universities (AIU) is one the premier institutions of the country working for the cause of higher education since 1925. The inauguration of the East Zone Vice Chancellors’ Meet was graced by the presence of the honorable Member of Parliament, Kamakhya Prasad Tasa, who emphasized on the need for improving the quality of education in the region and urged the Vice Chancellors and AIU to take necessary action for the upliftment of society. Over a period of two days, four technical sessions were held, each based on a sub-theme discussing employability and higher education in the Eastern region of India. The 19th of January saw two panel discussions. The first session, chaired by Prof. S.N Puri, Former President of the AIU, was on the main theme of the event, ‘Enhancing Employability of Products of Higher Education in the Eastern Region’. The second technical session was chaired by Prof. Sunil Rai, Vice Chancellor, Kaziranga University, where the sub-theme was ‘Challenges and Opportunities for Higher Education in the Eastern region, the North East in particular’. This day ended with a delightful cultural programme for the distinguished guests, which was organized by the students of Kaziranga University. Two more technical sessions were held on the 20th of January. The first was based on the sub-theme ‘A structured model for sharing faculty and laboratory resources with due credits be framed for the universities of the Eastern region, keeping in view of accessibility and environmental constraints’. This session was chaired by Prof. Pankaj Chande, former President of AIU. The second session was chaired by Prof. C.K Kokate, Vice President of the AIU and was based on the theme ‘Possible new courses to start within universities to meet the needs of the students from the North-Eastern part of our country’. This meet ended with a valediction, where proceedings of the two-day programme were summarized, and feedback and remarks were duly noted. The successful completion of the East Zone Vice Chancellors’ Meet was indeed a major accomplishment, particularly for the North-East. The Association of Indian Universities commended this constructive meet, and resolved to address the issues discussed with the Vice Chancellors regarding higher education and employability. The AIU officials and the Vice Chancellors were happy with the way Kaziranga University organized the event with utmost professionalism and welcoming hospitality, and expressed their gratitude, applauding the smooth sail of the event and thanking Kaziranga University for hosting it.